Last week, the Nebraska Supreme Court abolished electrocution, the state's sole method of execution. "Condemned prisoners must not be tortured to death, regardless of their crimes," Judge William Connolly wrote in the 6-1 opinion for the court. The decision can be seen as part of the broader movement away from capital punishment in many states. (Nebraska's unicameral legislature fell one vote short of abolishing the death penalty last year.) But it was also a personal victory for one legislator in Nebraska. 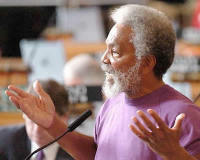 The reason Nebraska was the last state to have electrocution as its preferred -- and indeed only -- method of execution was that Sen. Ernie Chambers had consistently blocked any effort to move toward lethal injections. (Lethal injections are now the preferred method, although they are currently on hold nationwide as states await a Supreme Court decision to determine whether lethal injections are also unconstitutionally cruel). When I interviewed Chambers for a profile last fall, he talked about how he had long strategized about just such an outcome. He was confident the court would find the electric chair unconstitutional, leaving the state without any legal means of electrocution. "The thing that I fought the hardest in my career for will be achieved," he told me. "Not through legislative action, but I will have played a part."